Ryan's Smashing Life: HARD ROCK for JAPAN - Tonight! HARD ROCK for JAPAN - Tonight! Boston music website Playgroundboston.com is hosting a charity fundraiser at The Rosebud Bar in Somerville, MA tonight to benefit the victims of the recent Tohoku-Pacific Ocean earthquake in Japan. 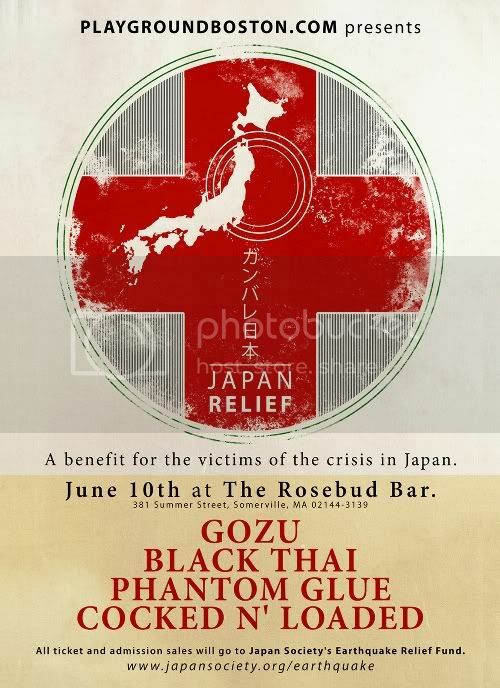 Local bands Gozu, Black Thai, Phantom Glue, and Cocked ‘n’ Loaded have been tapped to provide the evening's entertainment, and local companies and organizations have generously contributed prizes for a raffle, all designed to raise as much money as possible for the victims of the natural disasters that struck Japan in March of 2011. Around the northern coastal region of Tohoku, the Japanese government reported that 2,852 buildings were destroyed and over 40,000 were damaged either by earthquakes, tsunami, or fire. The tsunami waves caused the greatest destruction - an estimated 5,000 houses remain inundated with water in the Iwate prefecture, 2,000 houses were washed away in the Sendai city of Miyagi, and 1,800 houses were destroyed in nearby Fukushima. The count of houses destroyed by these disasters is also expected to increase as government assessment teams gain additional access to the affected areas. "There is always a massive outpouring of relief efforts in the immediate wake of natural disaster, but it can often be overlooked that after the initial wave of donations, there is still much to be done to repair the very fabric of society that has been shattered by crises such as these," says Bryan Donoghue, Editor-In-Chief of Playgroundboston.com, a website dedicated to promoting local music and building a community of artists and fans alike within Boston. In an effort to raise the largest sum possible, Playgroundboston.com has organized a raffle featuring prizes [here they are] from such esteemed organizations as Sony, Narragansett, Live Nation, Audio Cotton, Chameleon Tattoo & Body Piercing, Secret Society Ink, Stingray Body Art, Coda Bar & Kitchen, Canary Square, The Gaff, and many more.